Should my business use an in-house marketing strategy or hire an outsourced marketing agency? This has been a common question for business professionals and a hot topic in the marketing industry. Experienced marketing professionals will assure you that this particular topic regarding the best marketing strategy, has had its own periodic wave of discussion every now and then. However, the most recent wave is particularly interesting to me because there is an abundance of new technology that is affecting the way that marketing strategies are being executed. 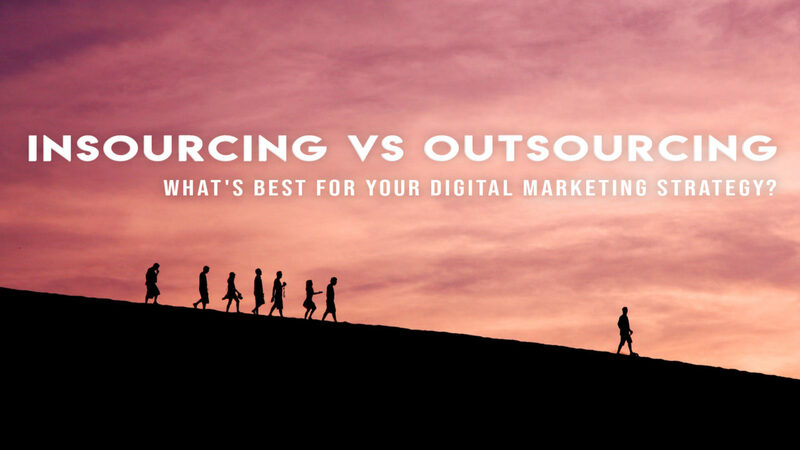 Unfortunately, there is no simple A or B answer to the question of insourcing vs. outsourcing marketing for your business. Every company is different, every budget is different, every marketing goal is different. Each marketing situation should be analyzed and decided on independently. In other words, just because you completed project A in-house, doesn’t mean you should do the same for project B- or vice versa. In a study conducted by Smart Insights, they discovered that owners, CEOs and other department heads spend 60% of their time managing digital marketing strategies and activities. Sound familiar? We encourage you to reflect on your marketing efforts. Decide if this is truly the most productive way to spend your valuable time. The communication process that conveys your marketing goals can be much more easily communicated with an in-house team as opposed to an outsourced agency. Not only is the team in the same building as you on a daily-basis, but they are submerged in your company’s culture every day. Your in-house team will more than likely have a stronger, sharper image of your brand as opposed to an outside team. But, keep in mind that this is applicable only if you are investing the necessary time and management into the marketing process. With your own in-house team, your company is the centerpiece of their focus. They don’t have multiple clients or projects that they are working on; they only have one, yours. You have complete control over the marketing strategy, projects, deadlines and other marketing decisions. In addition, you can also get projects on the fly- without the added cost. Salaries, benefits, marketing tools, not to mention the array of responsibilities you take on when hiring employees; an in-house marketing team can really add up. The average salary of a CMO alone, (not to mention the employees working under them,) can cost you nearly $200,000 annually. You may think you could get away with a one-person marketing team, but you will quickly realize that it’s just not possible. Marketing is a spider web of many components and although they all intertwine, it is impossible for one person to be disciplined in all areas. Successful marketing is definitely a team sport. If you’re starting to build your in-house marketing team or working on an extensive project, it can be hard and costly to find a marketing expert or a team of marketing experts for that matter. Knowledge, experience and connections are vital in the industry and they come at a high cost. Finding the right people is hard. The money you spend on promoting a job opening, the time you spend conducting interviews and then the on-boarding process. If you’re in business, you understand the breadth of work that goes behind hiring new employees. Not only are you looking for the expertise and talent, but you’re also looking for individuals that will blend with your company and existing team. All of this takes massive amounts of time and money. Although you may have to go through similar vetting processes when choosing an agency, it’s much easier, less time consuming (approximately a week) and costs less to hire an agency. Marketing agencies are chock full of talent, with teams of marketing specialists. They also have the luxury of seeing your brand from the outside looking in. It’s easier for them to put themselves in the shoes of a customer, as opposed to an in-house crew. They are not involved in any kind of office politics, group think or keeping the status quo. They are a team of professional marketers with fresh insights and ideas, as well the talent needed to carry them out. Consequently, you will end up with a great marketing strategy that produces results. Agencies are paid to perform well and their business’s reputation is on the line if they don’t. Marketers who truly know what they’re doing and take pride in their work will provide clients with proof that they’re marketing strategies are working through presenting analytics. This results in less headaches and more time for c-level executives to run their array of business operations and responsibilities. As said above, results are what matter! Ultimately, it all comes down to return on investment. It is much easier and much more attainable to measure your ROI when you hire an agency. When you work with an agency, you are charged a fixed amount (according to your contract) and then you are presented with results that you paid for on a silver platter. A common complaint of working with agencies is the response time. There are various reasons that this might happen. More than likely, they have other clients that they’re working on and other deadlines to meet. This is not an excuse for marketers to be unresponsive. However, it is something to keep in mind when deciding which route to take. If this reason is holding you back from hiring an agency, I would advise you to agree on a timeline and put it in the contract. Choosing the wrong agency can be a scary situation. It can be extremely stressful, costly and sometimes even result in legal matters. Due diligence is so important when choosing a marketing agency. Look at their case studies, past work, and reviews. Look at their background, mission and philosophy. Be sure that your two companies will mix well together and that they can in fact meet your KPI’s. Putting your intellectual property at risk is always a major concern. Similarly to what we mentioned above, due diligence is so important when you’re searching for an agency. It feels almost ridiculous to point out, but research the reviews and reputation of the agency that you’re looking at. A good agency will value your IP as much as you do. Great marketing content comes out of a close relationship with client and agency. Build trust and open communication with your agency partner. (Does this sound like marriage advice or is it just me?) Don’t forget that NDA, either! Ultimately, the best decision for your company is going to depend upon your need, goal and budget. For a smaller project, it may make more sense for you to take care of it in-house. For a project that you may not have the tools, time or budget for, it may be better to out-source it. If you’re not sure and you’re having trouble deciding the best route to take, give us a call. We’ll work with you through your decision and point you in the best direction that will grow and support your business. also added your RSS feeds, so when I have time I will be back to read a lot more, Please do keep up the excellent work.